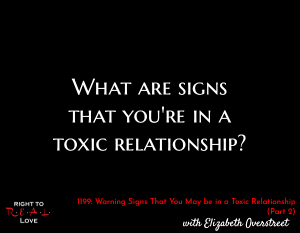 In this episode, Yahnathan continues his discussion with relationship coach and author Elizabeth Overstreet by addressing the question: What are signs that you’re in a toxic relationship? What are signs that you’re in a toxic relationship? Why having a spiritual compass is valuable. How to respond if you discover you’re in a toxic relationship. Don’t ignore red flags and indicators that you may be in a toxic relationship. Examine your current relationships (platonic and romantic) to determine whether they are healthy or toxic. Seek Yah in prayer for guidance regarding any toxic relationships you may be involved in.